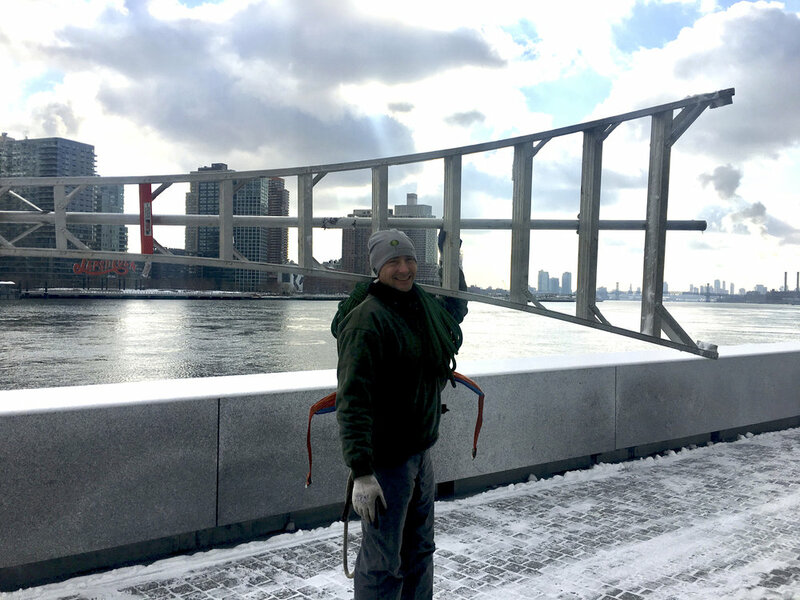 Our most intrepid visitors, those who have braved the icy winds and trekked their way to Franklin D. Roosevelt Four Freedoms Park in the height of the January and February freeze, have been rewarded by the most resplendent winter sunlight to be found anywhere in these five boroughs. It may come as no surprise, then, that our 125 trees, bared of leaves and in expectation of their months-long arboreal hibernation, are particularly susceptible to the destructive capabilities of the low-angle light that fills even the frostiest Roosevelt Island days with the vivid brightness of the sun’s unceasing warmth. Paul Wagner, president of Greener Pastures, visited the park on December 14, 2017 to install a protective paper sheathing on five of the Park’s most vulnerable trees: three little-leaf lindens, and two copper beeches. With three decades of landscaping and tree-care experience, Mr. Wagner is particularly knowledgeable about the dangers of winter sunlight. The Greener Pastures team wraps the trees with a natural paper commonly used in fruit orchards. The wrapping can guard the trees against not only direct sunlight but also light and heat reflected off the Park’s many white granite surfaces. Preserving the Park’s trees is an essential component of maintaining the Park for future generations, and Paul Wagner and his team have been assisting the Conservancy’s operations managers with this preservation since before the Park opened to the public in October, 2012.